We’re excited to show off a community project from our newest Community Building Blocks partner; the District of Columbia Building Industry Association (DCBIA). The DCBIA is an association of business owners, developers, general contractors, architects and engineers, attorneys, brokers, community development organizations, and others involved in real estate development. Its mission is to be the voice of the real estate development community, build leaders, and partner with governments, businesses, and civic organization to help make Washington, DC a vibrant city. Each year, they organize “DCBIA Community Improvement Day” to spruce up a community site that needs repairs but has a lot of potential. DCBIA architects and general contractor volunteers put in months of design work and community engagement meetings to finalize the vision for the site. On September 22, 2018, DCBIA members came together for their 26th Community Improvement Day to beautify Keene Field, located at 5205 Rock Creek Church Road NE, in Ward 5. The field borders the DC Bilingual Public Charter School and provides abundant space for playing soccer and hosting community events. It is popular with youth and adults from nearby neighborhoods, but it is still underutilized, so the DCBIA worked with the Department of Parks & Recreation (DPR) and community members to improve the area and maximize its potential. 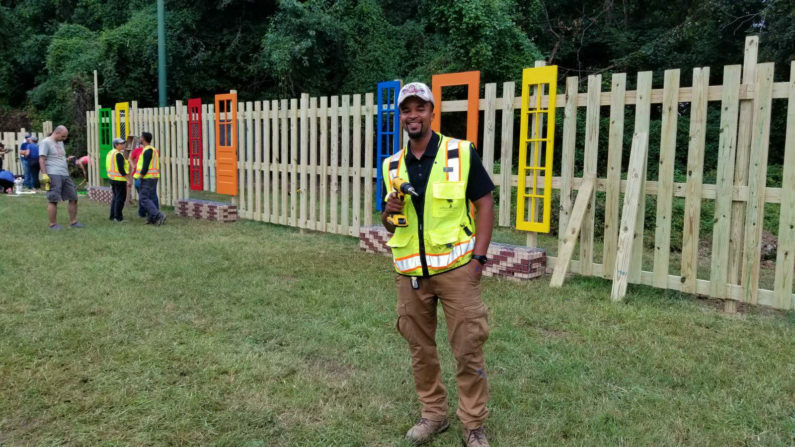 One part of the project called for a fence that would let light and air through, and the designers hoped to give it a creative and colorful touch with salvaged doors. Engineer Lamar Lewis, Zone 3 coordinator for the project and a Forklift customer, heard about our Community Building Blocks Program (CBB) through friends. He applied for a materials grant for the DCBIA, and was awarded $1,000 in store credit. With only a few days to go before the day of the event, our Outreach & Education team helped him find a ladder and 11 sturdy wood doors. DCBIA members have devoted 6 months of their time designing the site, they collected $20,000+ worth of donated materials, raised $66,000 for the project and had 400+ volunteers participate in this project. 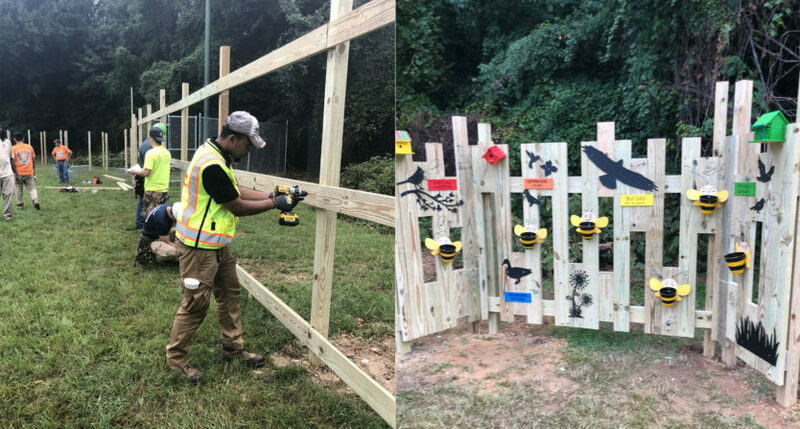 In addition to the fence, improvements included hillside games, entry portals and signage, butterfly gardens, seating and shade structures, a walking path, exercise equipment, and landscaping. Here at Community Forklift, we were thrilled to give materials to such a useful project! We are so glad that the new and improved field will better serve the neighbors of all ages who come to play, relax, visit, learn, and grow.